Powers/Abilities: Harrow had no superhuman powers but was a talented surgeon/scientist. Harrow suffered from trigeminal neuralgia which paralysed the left side of his face, pulled the left side of his mouth into a permanent snarl and caused him constant, agonizing pain. History: (Moon Knight: Fist of Konshu#2 (fb) BTS) - Dr. Arthur Harrow was a candidate for the Nobel Prize in medicine for his work in the field of pain theory. However, Dr. Victoria Grail had become suspicious of how his work had advanced despite the fact his papers indicated he had only carried out limited research on animals. Grail raised an objection to his nomination when she traced documents relating to secret experiments by Nazi scientists in Auschwitz back to Harrow. The documents had been ordered to be destroyed by the Nuremberg Tribunal but had mysteriously disappeared. Despite allegedly being in Mexico to research the jaguar and armadillo, Grail was certain that Harrow was carrying on the Auschwitz experiments and was sent by the Nobel Committee to interview him and report back to Stockholm. At an unknown point in time, Harrow became an agent of O.M.N.I.U.M. who funded his research into finding a way of making the human body impervious to pain and he was set up in a secret laboratory beneath the ruins of a Mayan pyramid where he experimented on peasant laborers, who he brought under his control. Harrow sought this as a way to cease his constant pain and facial paralysis, however O.M.N.I.U.M. 's ultimate goal was unknown. 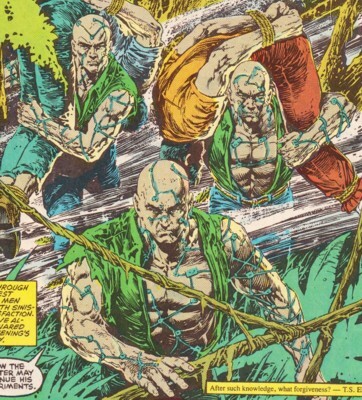 (Moon Knight: Fist of Konshu#2) - Three of Harrow's subjects captured two more peasant laborers from the hemp fields and took them back to Harrow's laboratory in Northern Yucatan. Soon after, the Priests of Khonshu appeared to Marc Spector whilst he was driving, causing him to crash the car and showing him mental images of Harrow, one of his subjects, Victoria Grail and the pyramid. Aware of Grail's presence in Yucatan, O.M.N.I.U.M. sent two locals, Coco and an unidentified accomplice to capture her. The two forced her into a van with a knife to her throat, but the kidnapping was witnessed by Marc Spector who swiftly changed into Moon Knight and rescued Grail from her captors. Grail was initially dismissive of Moon Knight but when he asked her about a disfigured man, she realized that they were both seeking Dr. Harrow and explained his history to Moon Knight. Meanwhile in his laboratory, Harrow had one of his latest subjects strapped to a table with electrodes implanted into his body. He sensitized and inflamed the nerves, then used transcutaneous stimulation to completely desensitize the laborer's body, as he displayed no feeling as Harrow cut his forearm with a razor. Harrow realized he was close to achieving his aim, needing only to transfer the result into a chemical formula to remove the need for wires and electrodes. At that point, Harrow received a transmission from O.M.N.I.U.M. confirming that Grail had escaped her captors and that they were sending a robot plane to collect him and all coded documents shortly after 10pm to ensure that the existence of O.M.N.I.U.M. remained a secret. Harrow knew he had no choice but to obey as they held the money and the Auschwitz documents, but vowed that once he was cured they would no longer dictate terms to him. Moon Knight and Grail tracked down Harrow's hideout but Harrow watched them arrive and released a jaguar from a cage. Moon Knight stunned the jaguar by flipping it into a wall and tied it up. He then located a false wall and smashed it open with a desk revealing stairs down to Harrow's secret laboratory. The pair were confronted by six of Harrow's subjects as a fleeing Harrow told them he had ordered them to kill Moon Knight and Grail. Grail told Moon Knight to try not to harm the innocent laborers but his hardest punches had little effect on them. Still unsure of his moon-augmented strength, Moon Knight accidentally broke the arm of one of Harrow's subjects who never even noticed the injury. Aware that he couldn't defeat them without causing significant harm, Moon Knight instead decided to make a run for it and was able to wrench the solid steel door from its hinges, allowing him and Grail to escape from the pyramid. As they did so, Harrow was climbing a rope ladder to board his escape helicopter. Moon Knight prepared to try and bring him down with a boomerang but an incendiary device was dropped from the copter forcing Moon Knight to concentrate on rescuing Grail. Harrow escaped and was greeted by the mysterious man behind O.M.N.I.U.M. who confirmed that Harrow was to continue his experiments in a new laboratory in Asuncion, Paraguay and log his findings in their master encycloputer. Grail was to be left alone for now, but she and Moon Knight would one day rue interfering with O.M.N.I.U.M. Comments: Created by Alan Zelenetz, Chris Warner and E R Cruz. Trigeminal neuralgia, or tic douloureux, is a neuropathic disorder characterized by episodes of intense facial pain in one side of the face. It has been described as among the most painful conditions known to man and could affect 1 in 15,000 people. Whilst Harrow complained of agonizing pain every hour whether awake or asleep, the condition is usually described as a sharp, stabbing pain with attacks lasting from a few seconds to a couple of hours. The cover for the issue shows a more zombiefied, skeletal figure attacking Moon Knight, but in the story Harrow's victims were still alive. There was no suggestion in the story that Harrow had any link with Jonas Harrow, but the surname certainly does seem to attract it's fair share of mad scientists. Meanwhile O.M.N.I.U.M. is still apparently waiting for its chance to make Moon Knight regret interfering (or maybe they're still trying to work out what the acronym stands for or what an encycloputer is...). Also, whilst the O.M.N.I.U.M. agent described the escape vehicle as a robot-plane, what turns up to evacuate Harrow is a helicopter. The images of the O.M.N.I.U.M. agents are the best ones that were shown, with the only other shot of the head of O.M.N.I.U.M. being a long distance shot of a shadowed figure behind a desk. Dr. Victoria Grail was sent by the Nobel Committee to interview Dr. Arthur Harrow and report back to the Committee in Stockholm. Grail wanted to take the job as she had become aware that Harrow was secretly using information from documents relating to experiments conducted at Auschwitz to carry out his research and her father's entire family had died during those original experiments. Grail arrived in Yucatan but was quickly taken hostage at knifepoint by Coco and his associate, who had been hired by O.M.N.I.U.M. to dispose of Grail. Marc Spector witnessed Grail being taken hostage and followed as Moon Knight. He rescued Grail, who told Moon Knight why she was in Yucatan. 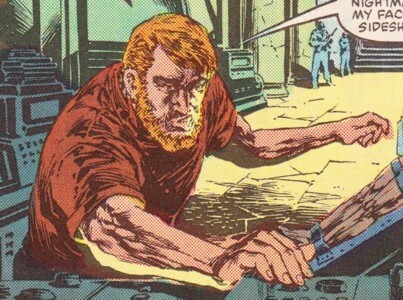 The two found Harrow's secret laboratory but were prevented from capturing Harrow by his subjects who had been ordered to kill Grail and Moon Knight. 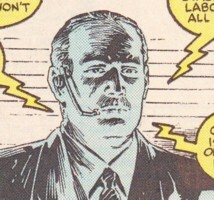 The pair managed to escape when Moon Knight was able to wrench the steel door from its hinges but as they left the laboratory, Harrow was already escaping aboard a helicopter. Moon Knight saved Grail from an incendiary device thrown from the helicopter and she kissed him to show her thanks. Grail was happy that even though Harrow had escaped, she could prove that he was an insane criminal. Harrow's subjects were Mexican peasant laborers who he abducted from the hemp fields. He implanted electrodes and experimented on them allowing him to control their actions. He also used them as guinea pigs for his experiments to devise a way to give the body immunity to pain. At least one had a device on, or implanted into, his wrist allowing him to access Harrow's secret laboratory. 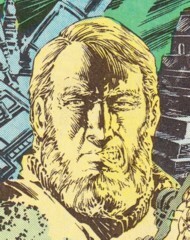 Harrow appeared to have succeeded in his experiments to the extent that neither broken bones nor punches from the Moon-augmented Moon Knight had any effect on the subjects. After Harrow's escape, Grail was hoping to find a way to help the subjects. Coco and his associate were local villains, hired by O.M.N.I.U.M. to dispose of Dr. Victoria Grail. The pair abducted Grail with Coco's friend holding Grail at knifepoint whilst Coco fired shots into the air to deter any would-be heroes. As they tried to escape in a van, Moon Knight (who had just met Grail as Marc Spector) followed them and landed on top of the van. As Coco's friend spotted him, Moon Knight punched him in the face knocking him from the van and then knocked out Coco with a bolo, allowing Moon Knight to rescue Grail. O.M.N.I.U.M. apparently had a number of agents, including Dr. Arthur Harrow who they had funded in a secret laboratory in Yucatan, Mexico assisting him with documents from experiments at Auschwitz so that he could find a way to make the human body immune to pain. 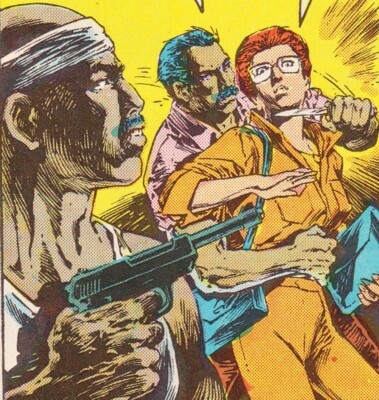 They hired Coco and his associate to capture and kill Dr. Victoria Grail, but they were stopped by Moon Knight. One O.M.N.I.U.M. agent (pictured left) contacted Dr. Harrow to inform him that the plan had failed and that he needed to evacuate by robot-plane that evening. Following his escape, Harrow was brought before the head of O.M.N.I.U.M. (pictured right) who said that Grail's escape was not his fault and that he would be set up in a new lab in Asuncion, Paraguay to continue his experiments, which would be logged on their master encycloputer. He also vowed that, whilst there was too much attention on Dr. Grail to take action now, she and Moon Knight would regret interfering in O.M.N.I.U.M. 's plans.